Muintir na Tíre – the National Association for the promotion of Community Development in Ireland – was founded in 1937 by Canon Hayes PP, Bansha, Co Tipperary. Initially the focus of the association was on rural communities, encouraging the promotion of community development and thereby raising the standards of people living and working in rural Ireland. Over the years the organisation has developed, expanded and grown in strength. Now, 77 years later, Muintir na Tíre has built up a national network of community groups both urban and rural dedicated to helping their own local communities to become more viable and self-reliant. The emphasis continues to be placed on active community participation. Like many other rural communities of the time the people of Abbey were influenced by the work started by Canon Hayes. 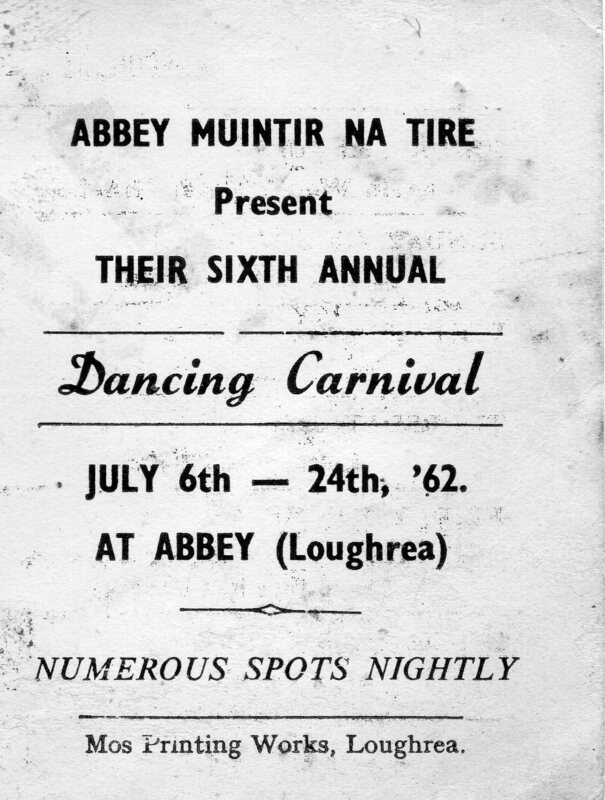 A Mayo man, a Mr Moran, was an organiser for Muintir na Tíre and he contacted Abbey in 1955 to encourage the community to set up a branch of Muintir na Tíre. With the approval of the Parish Priest, Fr O’Reilly, a meeting was arranged for November 1955 to take place in Abbey school. There was great local interest even though there was much discussion beforehand as to what the meeting was about with one man suggesting that it was non-political! The result of the meeting was a decision to form a local guild of Muintir na Tíre. 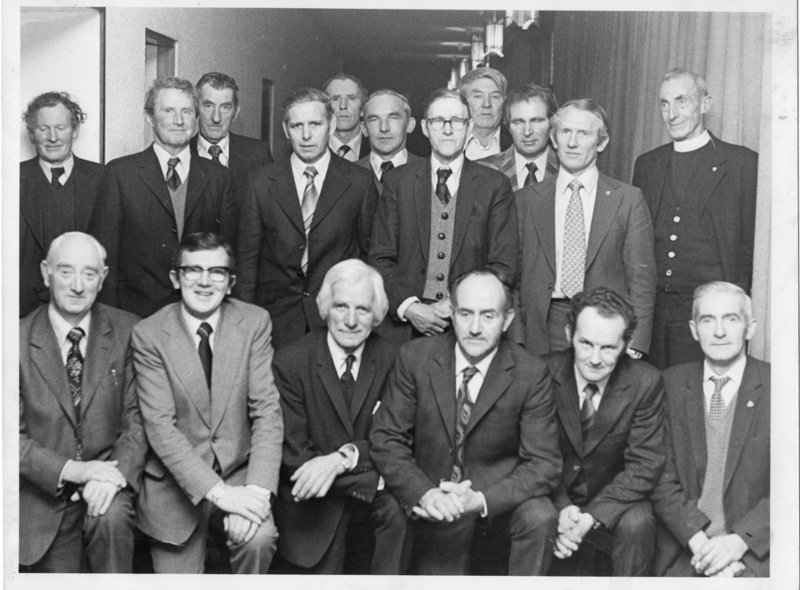 The attendance at that first meeting included Fr O’Reilly PP, Fr Reid CC, Willie Lynch, Miko Kelly, Tom Joe Hanrahan, Frank Hynes, Michael Lynch, Dessie Lynch, Pete Sheil, Thomas Pierce, Pakie Larkin, John Muldoon, Paddy Roche, Michael Burke, Michael Dervan, Jimmy Kelly, Francis Conroy, Martin Mullen, Joe Finn, Gerard Dolan, Paddy Lyons, Gerald Coniry, Connie Donnelly, Jack Moloney, Tommie Joynt, Stanny Burke Snr, John M Larkin, Thomsie Connaire, Bob Larkin, Naoise Larkin, Tony Hodgins, Sonny Madden, Vincent McDonagh, Tommie Goonan and John Holohan. A membership fee of 2/6d per head was collected and the following officers were elected: Willie Lynch, Chairman; John M Larkin, Treasurer; John Holohan, Secretary. Monthly meetings were held in the national school with an average attendance of 17 members. Some members of Abbey Muintir na Tíre – front left to right: Michael Lynch, John Holohan, Connie Donnelly, John Michael Larkin, Naoise Larkin, Gerald Coniry; back left to right: Martin Mullen, Jimmy Kelly, Francis Conroy, Tony Hodgins, Tommie Joynt, Michael Burke, Thomsie Connaire, Martin Kelly, Michael Dervan, Gerard Dolan and Fr O’Reilly PP. The first function to be organised was a ’25 card drive’ in the school – a moderately successful event that did not finish until 8 am the following morning! A sports day was held in the summer of 1956 with events for young and old – the winner of the over 70s race being Danny Coniry. This group quickly realised that the school manager, Fr O’Reilly, was reluctant to make the school available for functions and there was a realisation that the lack of a hall or centre as a meeting place was a huge drawback. The members set themselves the task of raising money to build a Community Centre for the village. In early 1957 it was proposed at a meeting to hire a marquee and to organise a dancing carnival. Fr O’Reilly had grave reservations about this, on moral grounds, especially as the proposal came from some of the younger members of the group. The support of the more senior members for the proposal swayed the decision in favour of holding a carnival and agreement was reached. The securing of a dance licence in the civil courts was less traumatic! 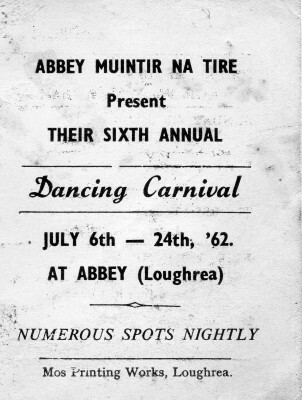 The first of many carnivals was organised from 7th to 21st July 1957. Bands had to be booked and a marquee had to be hired. Con Hynes the biggest marquee supplier in Ireland was totally booked out for 1957. A Dublin supplier, Bruce Quinn, did not transport to the country so Con Hynes was hired to collect one of Quinn’s marquees in Clontibret, Co Monaghan and to deliver to Abbey. It was an exciting time in Abbey – the marquee was erected in the school grounds and great efforts were made by the farming community to have the hay saved before 7th July! The first carnival opened on Sunday 7th July 1957 with Kevin O’Doherty and his orchestra from Dublin providing the music for opening night. Admission was five shillings and dancing was from 9 pm to 1 am. Dancing continued on Tuesday 9th with Abbey Ceili Band; Wednesday 10th – Donie Collins; Friday 12th – Andy Hennessy; Sunday 14th – The Blue Rockets; Tuesday 16th – Andy Hennessy again! ; Thursday 18th – Des Fretwell Orchestra, Galway; Friday 19th – Leitrim Ceili Band and the final dance on Sunday 21st with Debonairs Showband, Dublin. By the end of that first carnival all apprehensions had vanished and there was a great sense of achievement that everything had gone so well. The profit from the first carnival was €400, a considerable sum in 1957, and added to the committee’s determination to make this fundraising an annual event until the target sum for a Community Centre was reached. 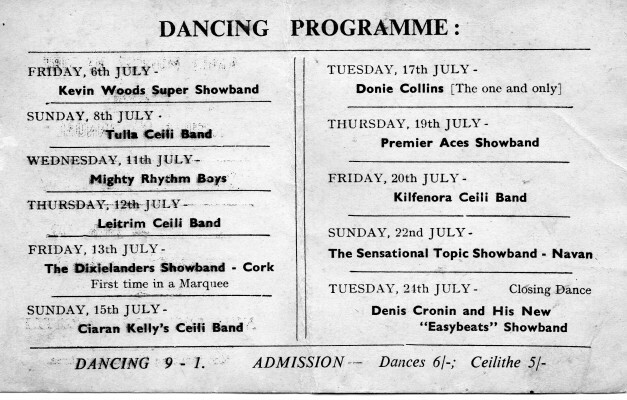 Over the next seventeen years nearly all of the top bands in the country had played at Abbey carnival but two in particular were booked to play every year – Donie Collins and his band and the Tulla Ceili band – catering for a different clientele – were particularly popular. There was a terrific atmosphere at the dances – people came to enjoy dancing, some never leaving the floor. The only refreshments provided could be bought at the mineral bar in the marquee, which consisted of a shelf on one side of the stage. Orange and lemonade were the only beverages and over the course of the ten dancing nights of the carnival 200 dozen minerals were sold. The initial admission charge of five shillings to the dances and four shillings to the ceilis increased only slightly over the years. Each year, all the bands were treated to a sit-down meal at Ryan’s house. Mrs Annie Ryan provided excellent meals by arrangement with the committee and all musicians were very appreciative. During those years there was great community participation and all involved were very active with various people undertaking responsibility for specific tasks. Martin Kelly and Sonny Madden oversaw the erecting and maintaining of the marquee and the levelling of the dance floor was a priority for them. Such was their expertise that there was never a complaint from the dancing public. Others like Connie Donnelly and Michael Lynch took on the role of chairman at various times. Vincent McDonagh was an excellent secretary for many years. John Michael Larkin was a very efficient treasurer who looked after all the finances in a most professional manner. Profits from the carnivals were invested in National Bank, Portumna and in the Government National Loan and as the funds increased it was clear that a Community Centre would indeed become a reality. There were no grants available at that time for such projects and the Centre was built and completed at a cost of £10,000 and paid for from the proceeds of the carnivals. 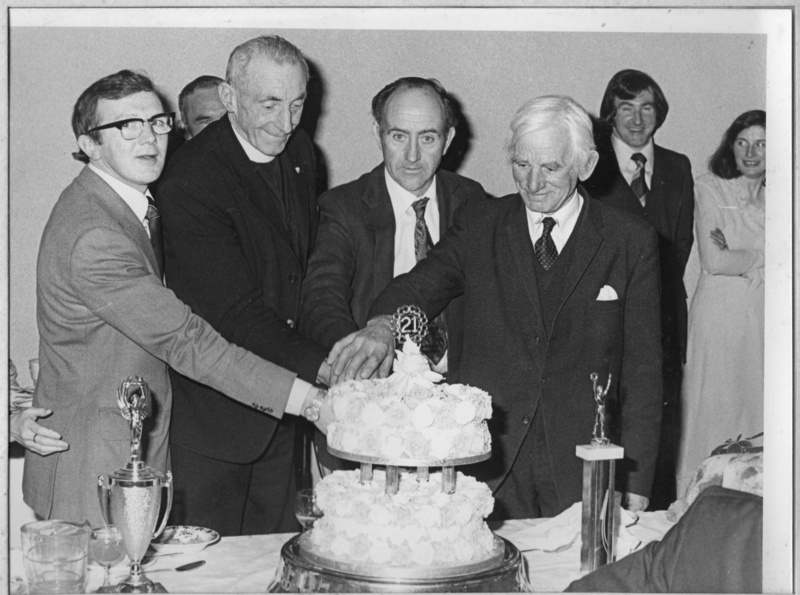 The then chairman, Michael Dervan and secretary John Donnelly were very proud members of the very dedicated committee when in 1967 the Muintir na Tire Community Centre was officially opened and blessed by Bishop Thomas Ryan with Fr O’Reilly and Fr Fahy in attendance. Celebrating 21 years from left: John Holohan, Fr O’Reilly PP, John Michael Larkin, Connie Donnelly; at back: Michael Burke, Paddy Moloney and Teresa Donnelly. Abbey Muintir na Tíre continued to thrive and in tandem with their many other projects, Vincent McDonagh, who was secretary at the time, was instrumental in starting another major project in the community – the provision of a group water system for the area – but that’s a story for another day!